Omikuji is called “Fortune telling paper” and usually taken as a fun, but it is a message from the gods and very important thing. 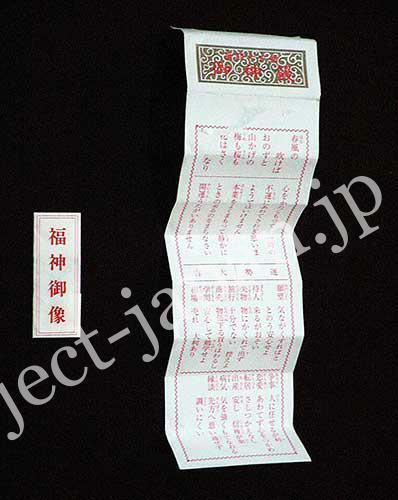 Though most omikuji contain a predictions ranking from Daikichi (“great good luck”) to Daikyo (“great bad luck”), the most important thing is not the ranking but the contents. If you pick up the “Daikyo” slip, it is the message from the god that “you must make an improvement in this point.”. So you don’t need to mind when your omikuji ranking is Daikyo. some omikuji (in Izumo Grand Shrine or Meiji Jingu Shrine, for example) have no ranking. One theory has it that you had better determine to consult Omikuji beforehand in your mind, not by a whimsical idea. First, make visit on a front shrine and tell the god your wish (what kind of things you want to know) when you offer a prayer. And you can get a pithy advice. It is a custom that people tie their omikuji to a branch, but it is said in fault. You can take it out. When your ranking comes out Daikyo, don’t consult many times because it shows you don’t believe the god’s message.